We have been manufacturing and exporting Slat Expander Roll from last 25 years in India. All our slat expander rolls available in different diameters with premium quality and suitable for slow speed machines. Our engineers have designed per clients requirement for coating machines, batching machine, and many more. 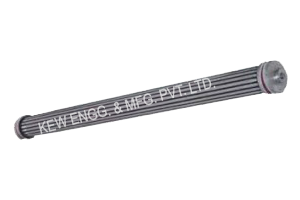 We Aluminum Slat Expanders are used for wrinkle removing on coating machines which is available in any length and standard diameter 6-. Bigger diameter can be made as per specific requirements. Normally plain surface is provided but some applications serration is required on surface for gripping. While ordering should provide the application temperature, web material, plain or serration required on surface, maximum speed of web material to meet all your requirements. For soundless working the Rubber Roller are also available with ball bearing type cam mechanism also. Normal expansion is 25mm. In this, 3:1 (lead-in: lead-out) ratio is considered to be the perfect. The best results are attained when Bow Roller is perpendicular to the web direction. Used in Different Industries : Industries Like Paper, Tyrecord, Plastic Packaging, Woven Sacks, Pharmaceuticals, Leather, Textile, Plywood, Sheet Line Material Handling and many more. Controlling Tension & Edge of Laminate / Fabric. Bow Rolls manufacturer, exporter, and Supplier from last 25 years, India. KEW ENGG. & MFG. PVT. LTD. is a company engaged in Manufacturing, exporting and supplying different types of Bow Rolls, Banana Roll, Metal Expander Roll, Slat Expander Roll and many more. KEW ENGG. & MFG. PVT. LTD. Copyright 2018 www.bowexpanderroll.com | All Rights Reserved. KEW reserves the right to change specifications & design without prior notice to incorporate latest development.